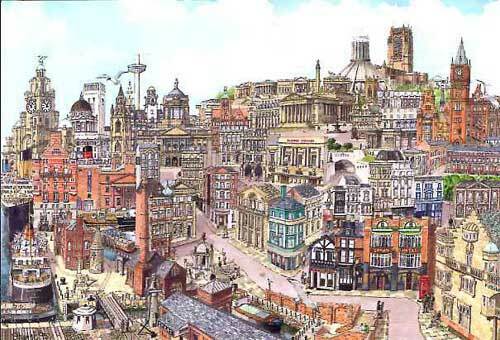 The richness and scale of so many buildings was a daunting prospect when I first wandered the streets of this famous city in the spring of 1995 seeking inspiration for my Liverpool cityscape painting. Despite all the activity of the shopping streets, the pride of the civic buildings, the two cathedrals vying for attention either end of Hope Street, the splendour of Waterhouse's University building, and so on; I kept drifting back to the waterfront with its three unforgettable office buildings and the Liver birds. These would have to find a prominant place in my Liverpool cityscape. Looking seawards along the dock front I imagined the sights and sounds of the countless thousands of emigrants making their way to the ships to sail to America and the new life it would bring. All those nationalities, and that excitement tinged with tension and uncertainty. Those buildings had witnessed a remarkable period in the history of the city — a history I hope was reflected in my Liverpool painting. The 'Titanic's' sister, the 'Olympic', the Isle of Man ferry, Cunard's 'Saxonia', and the Blue Funnel Line 'Hector', along with the Mersey ferry all found a place this Liverpool print to reflect their involvement with this once bustling port. Included too of course were the Fab Four, Cilla and Doddy.